Cooper Farms donated 15,642 pounds of sliced and bulk deli items including turkey, chicken and ham that were delivered by team members of Cooper Farms. 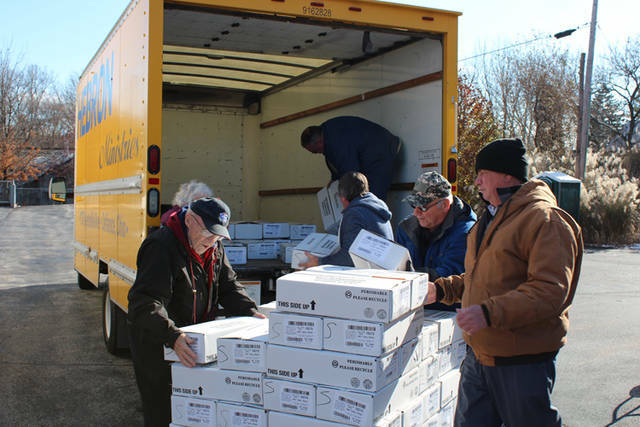 OAKWOOD — Cooper Farms donated 15,642 pounds of deli meat, valued at almost $50,000, to a variety of Williams and Defiance county food pantries, the Paulding County Senior Center and the 50th annual Feast of Giving in Dayton. The Feast of Giving is held on Thanksgiving Day at the Dayton Convention Center. The event brings in more than 8,000 guests who may be spending the holiday alone, homeless and less fortunate that may not be able to afford a warm meal or anyone else who wants to attend. This was the 50th annual Thanksgiving dinner in Dayton and the 10th year under the current leadership group. The recipients of the Williams and Defiance county donations included St. Mary’s Parish Ministry Center in Defiance, the Path Center in Defiance, Edgerton United Methodist Church and Grace Community Church in Bryan. The St. Mary’s Parish Ministry Center will not only keep part of the donation for its own use but also will further distribute to other pantries within the upper Northwest Ohio area. Cooper Farms always has made a point to give back to the areas it is located. With a new sow farm coming to the area, Cooper Farms is excited to begin building meaningful relationships with Williams County and further strengthen them in Defiance County, officials said. The donations consisted of a variety of sliced and bulk deli items including turkey, chicken and ham and were delivered by team members of Cooper Farms.